career working in the radio industry. likes looking at radio studios. Are you looking for a job in Radio? or just want to move on? glimpse into how it's all done. and bizzare questions over the years. See what you all said in the archive. i'm playing on my iPod at the moment. help plan your show / advertising. Thinking of taking a break soon? or maybe looking for somewhere to go? Check out my holiday guides and other stuff. Single ? need dating advice? We all need a bit of romance. the tips ideas & advice you need. Easter is the Christian observance of the crucifixion of Jesus Christ and his resurrection days later. Unlike festivals such as Christmas, Easter has been celebrated without interruption since New Testament times. Who was St. George and what about the dragon? St. George (died about 303), Christian martyr and patron saint of England. Known mostly for the legend involving his encounter with a dragon, saving the kings daughter and converting the community to Christianity. Father's Day is a celebration inaugurated in the early twentieth century to complement Mother's Day. The rose was selected as the official Father's Day flower, and some suggest that people wear a white rose to honour a father who is deceased, and a red one for a father who is living. One of my pastimes is visiting foreign countries. Here's a few guides to the places that I have been to and recommend for a fantastic vacation. For people working in the radio industry then this section has loads of information that you might find helpful. Elvis Presley is without doubt one of the most successful music artists of all time. Find out about his career and links to more Elvis stuff. Getting your views on the topics of the day is quite interesting. The archive lists all the past polls and details of what my visitors think. Are you thinking of changing your career ? Then here are the latest job opportunities for radio, TV and media. Check out all these radio station webcams. Has your station got one that needs adding to the list? As a radio presenter I love most music and like to keep up to date with new stuff. This page has some of my favourite current music videos. Hello and welcome to Paul Denton Online. 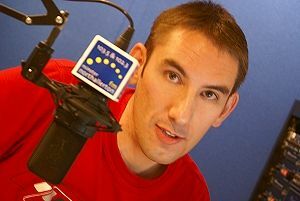 So you're probably wondering who this guy is well I'm a radio presenter from the UK and this website is all about me and my radio career. I've also included lots of advice for people working in the industry. If you're seeking advice on how to be a radio presenter then check out the radio industry information section on the left had side of this page. Here I've included loads of my top tips on how to present on the radio which I've pulled together from working in the industry for the past 28 years for stations such as Hallam Fm, Minster Fm and Peak 107fm. I'm always looking for your feedback on the website so please get in touch via email or the Say Hey! button which can be found at the top of each page. If you have anything that you think would be good to share with other radio minded people feel free to wing it across in an email. As well as all the radio information there's some fun stuff dotted around the website, jokes, funny pictures, travel reviews and of course I'd love to know your views in the polls which can be found on the right side of each page so go on get voting and let's see what everybody thinks. There's loads of questions on rotation and if you want to see past questions and responses then check out the archive. I can now be heard on www.ClassicOldies.co.uk Tune in weekday afternoons from 2 - 5pm for a whole bunch of classic songs from the 50's and 60's. I also present the 'Down At The Diner' show on Saturday Mornings from 9-1pm.